What if a Story were simultaneously hemmed in and also open to roam the landscape? What if the Story were merely small echoes of some larger narrative? What if the Story were not one Story, but many Stories? During Digital Writing Month (which took place throughout November), the narrative of how we tell stories often got upended a bit as we explored how technology is changing the shapes of stories themselves, as us, as writers of those stories. 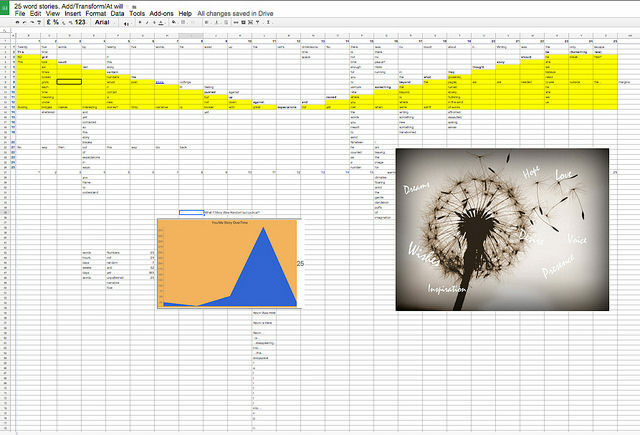 How fitting, then, that Simon took the concept of the #25wordstory (a Twitter activity to write a story in 25 words or so) and slotted it into a spreadsheet grid, and then opened up the grids for others to add to. I dug in yesterday morning with gusto, and quickly began writing all over the place, shifting from grid to grid, extending stories out from single anchor words so that the narrative arcs move in all sorts of directions. Truthfully, these became more like story fragments, little puffs of ideas floating in and among the rest of the stories. We pushed out beyond the margins. Added images and charts. Made links to places outside of the story. So, what does this all mean for writing in the digital age? I can’t say with any certainty what it all means, to be honest, but there is something there in this kind of transmedia-like storytelling — an associative leap that writers make when both writing on the same page as someone else on the other side of your world and when you carve out stories in unknown territories. A spreadsheet as story? A spreadsheet as a map of the territory? Yes, once you get past the idea of what a tool is designed for you (spreadsheets-numbers) and open up your imagination to what a story needs to thrive. The spreadsheet has become the Story itself, made up of smaller stories, made up of words and ideas, made up of Us. You come, too. Write in the grid, but push against the confines of those grids. Simon kickstarted the Story. Now, take the Story to where it needs to go. Take the Story with you. Leave the Story with Us.